A B.C. school board is investigating the source of a worksheet assigned to students in a Grade 10 social studies class after a parent expressed concerns it was misleading about people who hold conservative political views. A B.C. 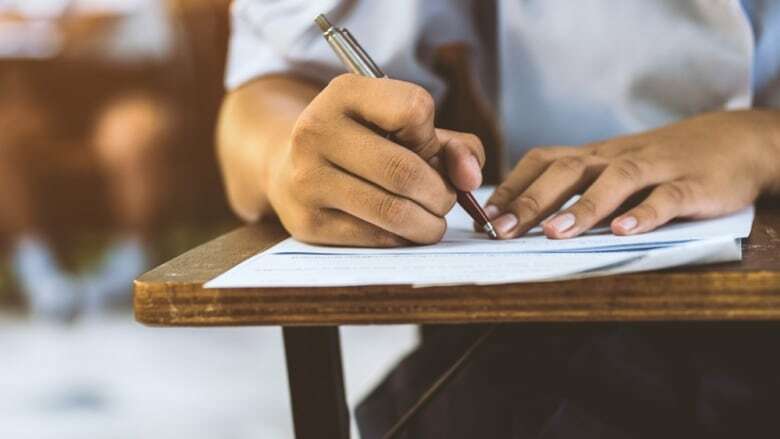 school board is investigating the source of a worksheet assigned to a Grade 10 social studies class after a parent expressed concerns it was misleading about people who hold conservative political views. 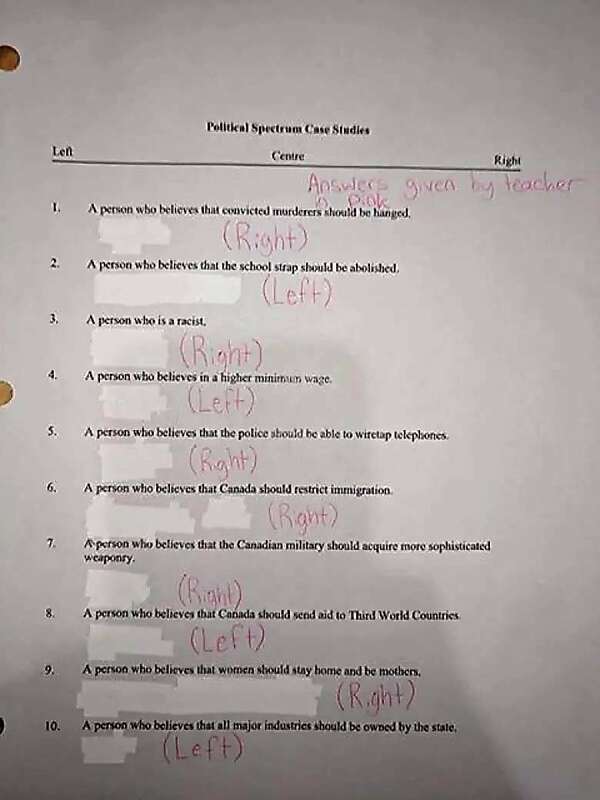 The assignment, intended to teach students in the Kamloops-Thompson school district about differing views on the political spectrum, listed a series of political statements and asked students to identify whether they're associated with right-wing, centre, or left-wing views. According to the answer key provided by the teacher, "a person who is racist" and "a person who believes women should stay home and be mothers," were associated with right-wing views. Matt DeFouw, who lives in Kamloops, said he became concerned about the worksheet on Monday when his son texted him a photo of the assignment from his class at Valleyview Secondary School. "I was very shocked to see what he sent," DeFouw said. "I'm a conservative-leaning person and I don't believe in executions or women staying home and not pursuing careers and their dreams, and I don't believe that I'm a racist. So it was very offensive." DeFouw posted the photo of the document on Facebook, and as of Wednesday night it had been shared over 2,000 times and generated over 500 comments. Commenters described the assignment as "weird," "disgraceful" and "very scary indeed," with one calling it "the brainwashing propaganda indoctrination of students." DeFouw said he contacted friends who work in the public school system across B.C., who found the worksheet in the online teaching resources provided to teachers. CBC News has not been able to independently verify that the worksheet is part of the provincial curriculum. Bill Hamblett, assistant superintendent of secondary schools with the school district, said an investigation is taking place into the source of the document and the context in which it was presented in the class. "The worksheet itself was not that balanced," Hamblett said. "It had an oversimplification of a very complex topic and the teacher realizes that and will revisit the lesson with the students to explore the topic more thoroughly. "Racism is not exclusive to one political stripe, so I know the parent was concerned about that political comment." DeFouw met with officials from Valleyview school on Tuesday, and said he does not blame the teacher for the worksheet. "I have the utmost respect for public education and the education system in general," he said. "I would like them to take [the investigation] further to make sure this doesn't happen again. We need to be teaching critical thinking. ​Everyone has bias, but educators need to be able to effectively remove their own bias and provide real information for students to consume."